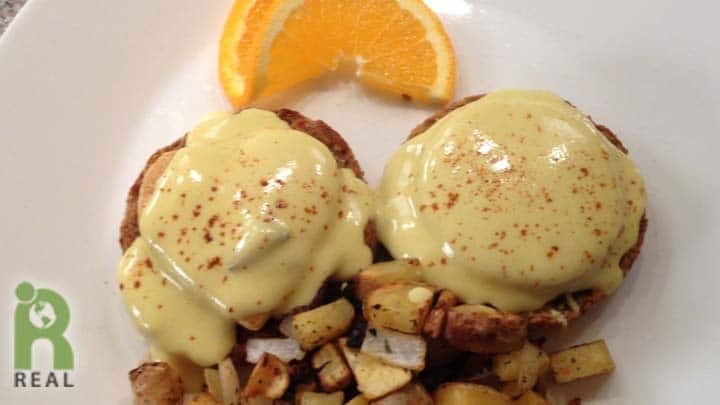 Here’s our REAL Vegan Hollandaise Sauce to top our No-Eggs Benedict Arnold, as seen in the Transition Kitchen. Add the saffron threads (or turmeric) and let ingredients incorporate for about 5 minutes over low heat. Be sure it does not boil. Strain in a small pitcher or non-reactive Pyrex measuring cup. Reserve two teaspoons of butter for brushing on tofu slices later. Whisk in the mayo in a double boiler on low heat until it becomes warm but not hot. Slowly stream in the melted butter a little at a time and continue to whisk. Add the lemon juice and cayenne pepper. Remove from the heat. 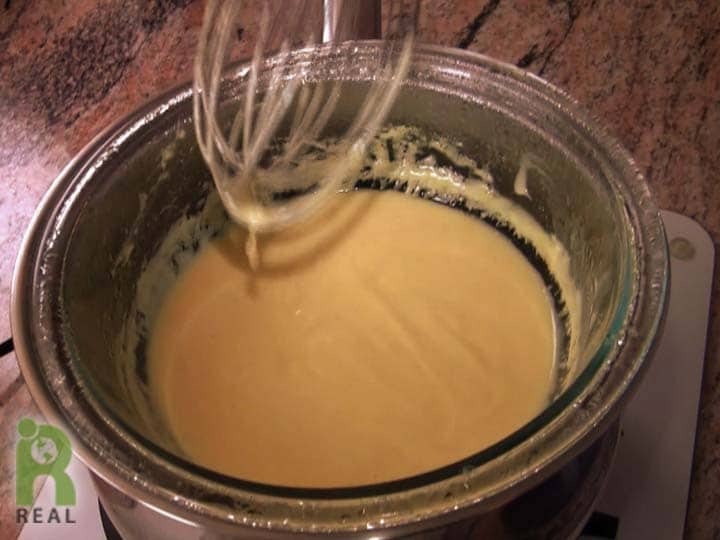 DO NOT LET THE MIXTURE GET TOO HOT OR IT WILL SEPARATE just like Hollandaise made with eggs. If it does separate, put about 2 ounces (about 1/6 of a 12 ounce block) of silken tofu in a blender. Temper by adding a quarter of a cup of the separated sauce and blend. Keep the blender running on low and stream in the separated hollandaise sauce. Like magic it will bind together. Keep warm but don’t let it get hot.